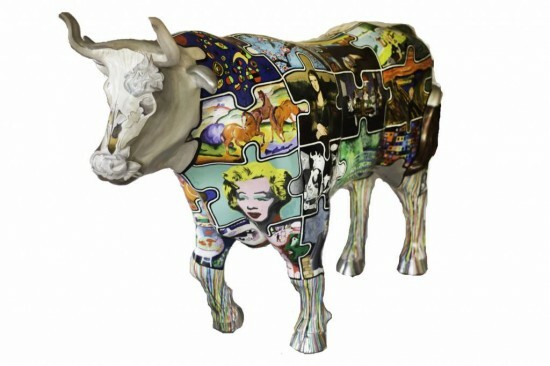 "A Puzzling Oxhibition" was awarded Second Place by our panel of Stampede judges. Congratulations! The fabulous artists of this "puzzling ox" were the advanced art students in Mrs. Cariola’s 8th grade Art 1 class (a high school level class that recommended students can take in middle school) and a few from the advanced 7th grade class, Art 7. When it came time to do the ox it was decided that this would be a great arena to showcase their talents. Approximately 30 students were involved in the creation of the this ox and the completion took countless hours during class, lunch and many after school “ox parties.” Throughout the process the students showned tremendous pride and dedication to making this an “oxceptional oxhibit of mooseum moosterpieces.” Each student was able to focus on one master painting of their choosing from a list of the great masters. Some students also did multiple paintings and assisted in helping others. This was a huge undertaking that involved organization, collaboration, teamwork and group effort. The students are extremely pleased with their results and are thrilled to be included in the Stampede.